The works in this exhibition cover the first 200 years of image-making inspired by the Australian flora, from the early European exploration of this continent down to Federation. They have been selected for this display from the exhibition Capturing Flora: 300 years of Australian Botanical Art, presented at the Art Gallery of Ballarat in 2012. While the images you will see here are all ‘botanical’, in that their raison d’etre was to aid the analysis and identification of the Australian flora, there are several distinct themes or sources of inspiration. The works in the first section come from journals and scientific publications that were produced in the wake of government-sponsored voyages of exploration. The botanical art from this period was inspired by the newly-formulated theories of scientific classification, particularly those of the legendary Swedish botanist Carolus Linnaeus. These are followed by botanical illustrations produced in Europe between 1790 and 1870 when ‘exotick’ plants from far-away places, including New Holland, became extraordinarily popular with gardeners, in spite of the difficulty of cultivating frost-tender plants in the northern climate. A vast illustrated literature developed to promote these plants, which flourished in stove houses from London to Vienna and beyond. The final section of the exhibition moves from Europe to the Australian colonies themselves. From the middle of the 19th century, each of Australia’s eastern colonies founded botanical gardens and employed botanists to run them and to conduct research in herbaria. Great botanists such as Ferdinand Mueller in Melbourne and Joseph Maiden in Sydney had recourse to a series of talented artists when publishing Floras for their respective colonies. Simultaneous to the ‘official’ documentation of Australian plants, an amateur tradition also developed in Australia in the 1830s as upper middle class women settled in the colonies, bringing with them a passion for capturing the beauties of nature using their genteel skills of draughtsmanship. By the end of the 19th century, some of these ‘lady amateurs’ had succeeded in working as paid artists for the Government botanists. These works will be seen in the latter section of the exhibition. The last works in the show manifest a pride in things Australian that became so evident in the decade leading up to Federation. 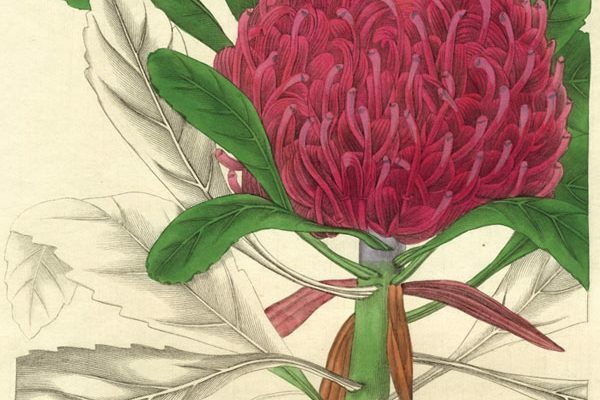 New South Wales, home to some of the most iconic Australian wildflowers, took the lead in botanical art at the beginning of the 20th century. Join Julie Collett, Art Gallery of Ballarat, as she discusses the Victorian Lady Amateurs and Female Botanical Artists from the 1800s, including Sarah Maund, Elizabeth Twining, Fanny Elizabeth De Mole and Eliza Blyth. List of Works – Can be found here.